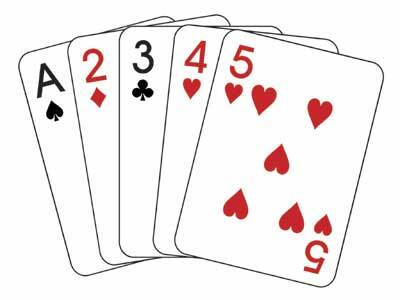 This story — “Bonduel school taxes going down: Increase in state aid one of reasons,” by Lee Pulaski in today’s Shawano Leader made me think of Richard Farina’s novel Been Down So Long it Looks Like Up to Me. That’s what has been going on with school funding in Wisconsin and around the nation, the cuts have been so regular and difficult that any relief, no matter how small, appears like forward movement. The reality, — in the Bonduel district, in Wisconsin and in most of the United States — is that these small steps forward don’t come close to making up for the giant steps backward of the last few years. The editorial board of the Wisconsin State Journal, Senator Scott Fitzgerald and others seize upon these small and local steps, but we can’t let their anecdotes distract from the big picture. Wisconsin Sate Senator John Lehman has promised to convene the Senate Education Committee to “to examine how these 1.6 billion dollar cuts have hurt Wisconsin Schools.” That’s’ a good start, but more is needed. We need more than examination, we need workable plans to fund our schools at a level and in a manner that puts the needs of our students first (see more on this below, at the bottom. Update: The agenda for the hearing is out — August 31 is the date — and it looks like they’ll just be documenting the destruction and previewing future damage.). The tools — if, as you should, you include in the tools the massive cuts in state aid to education which are central to the Fitzwalker game plan– aren’t working to provide students with the Opportunities to Learn that they deserve. 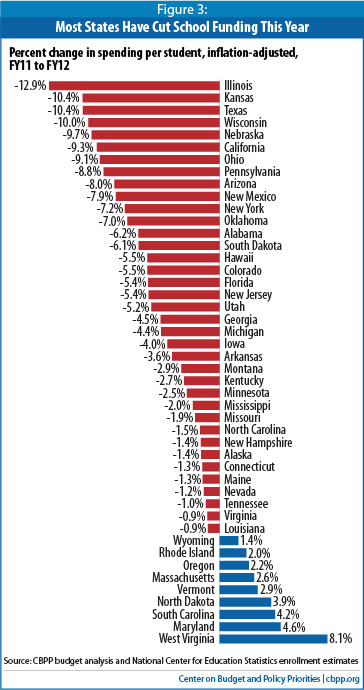 For the national scene see “New School Year Brings Steep Cuts in State Funding for Schools,” By Phil Oliff and Michael Leachman of the Center on Budget and Policy Priorities. Here is one graph from that report. Notice Wisconsin is the fourth worst state in this chart. That may improve this year because of a one-time $50 per pupil aid. But according to the July aid estimates from DPI, only 155 districts in Wisconsin can expect an increase in state aid the coming year, while 267 will see a decrease. Bonduel is one of the lucky ones. That’s what seems to be at the center of today’s story (it appears that they took a big hit last year and thatrevenues from 4K are kicking in too, like in Madison). Peter Behnke, the district’s administrator, gushed good news for the taxpayers, who can expect a 3.3 percent decrease in their school property taxes due to an estimated $250,000 increase in state aid, to about $5.6 million. “State aid is actually increasing for the first time in years, and that’s always a good thing,” Behnke said. But what is missing is that the aid doesn’t come close to restoring state funding levels to what they were three years ago and leaves state aid per member for 2012-13 an estimated $671.55 belowwhat it was in 2007-08 (and in fact aid increased in both 2009-10 and 2010-11). Here are some charts. 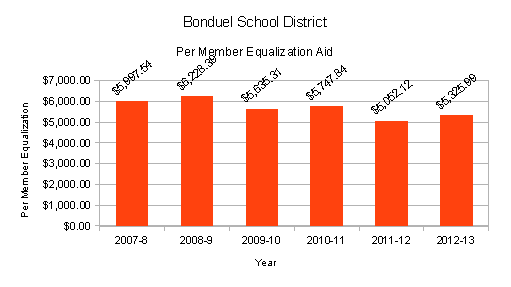 Note that the Bonduel district budget information is not accessible on the district website, charts were prepared using information from the Department of Public Instruction and the Legislative Fiscal Bureau, found here, here, here, here, here, here, and here. For the 2012-13 per member, the 2011-12 membership was used to estimate. 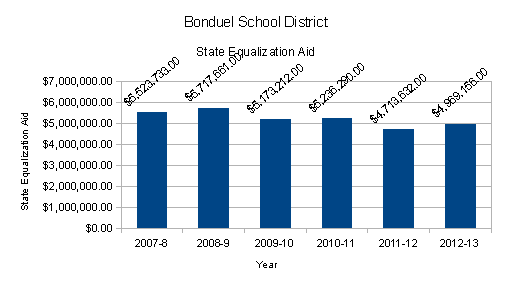 The first is total state equalization aid to Bonduel. The second is per member aid. That anyone familiar with this history can “gush” over the 2012-13 projections is evidence of how far down we have been pushed. We need to push back, up and out of this hole.. State Superintendent Tony Evers’ Fair Funding for Our Future is a start, but it won’t be enough unless it includes an influx of new state revenues. That’s one reason why I think something like Penny for Kids is more necessary now than ever. Penny for Kids would provide about $850,000 annually in new revenues for our schools. I also think that Penny for Kids inclusion of a real aid to schools educating students in poverty is essential to addressing the gaps in achievement that plague our state and district (Fair Funding includes increased state aid to districts based on student poverty, but no new money or taxing authority only property tax relief, so this will supplant, not supplement). These are still things worth working for. Just thinking about them lifts me up. 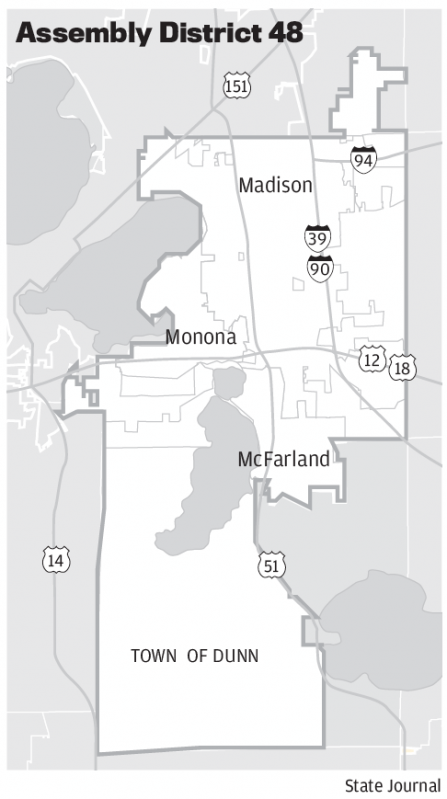 On July 12 the voters in the 48th Assembly District — covering the East side of Madison, Monona, McFarland and the Town of Dunn (map here)– will choose a Representative to the State Assembly to replace now County Executive Joe Parisi. The candidates are (alphabetical, linked to their web sites): Fred Arnold, Dave de Felice, Andy Heidt, Katherine Kocs, Bethany Ordaz, Vicky Selkowe, and Chris Taylor. I don’t live in the District, but like all progressives in the state, I have a stake in the race. Whoever is elected will be in a “safe seat” which means that they have the opportunity to do more than be a consistent vote; they can push the envelope by introducing and promoting significant progressive legislation, the kind of legislation that makes overly cautious party leaders uncomfortable. With the Republicans in charge, the rhetoric from the Democrats has been heartening, but it should not be forgotten that when they controlled the state from 2008-10 they did nothing to reform school funding except cut $300 million and raise the levy credit, did nothing on the minimum wage, failed to pass the Green Jobs bill, didn’t finish the Union contracts when they could, did much to little in progressive revenue reform…the list goes on. In this race I think people should look beyond opposing Walker to what kind of legislator the candidates will be when the Democrats are in control.There is no shortage in the legislature of “pragmatic progressives” who can find 1,000 reasons not to do the right things; there is a dire need for courageous leaders who will be steadfast in their advocacy both behind caucus doors and in public. Andy Heidt will be that kind of leader, that’s why he has my endorsement and why I’ve been helping with his campaign. To back up this assertion (and as a service to AMPS readers and voters in the 48th), I’m offering a series of posts examining what the candidates have and have not said about education issues, especially the core issue of school finance, and to a lesser extent the related issues of revenue reform (based primarily on their websites and on internet searches). In the interest of disclosure, I’ll note that I’m acquainted with three of the candidates and believe I have met at least three others and that some things that I know about them or impressions that have not appeared in campaign statements or biographies are part of the analysis. If anyone, including the campaigns has anything to add or dispute, please use the comments to bring it to my attention. This time the order is from who I consider the strongest to who I consider the weakest (Andy Heidt, Vicky Selkowe, , Bethany Ordaz, Fred Arnold Chris Taylor, Katherine Kocs and Dave de Felice — this may change as I do more research). Heidt’s argument that we must do more than merely prevent Walker from implementing his agenda. We must recognize that the crisis Walker is exploiting has its roots in the failure of Republican and Democratic administrations and legislators to recognize that Wisconsin cannot maintain services and public education if our politicians keep giving away tax breaks to multinational corporations and the wealthy. Nowhere has this been clearer (or in my head more important) than in his statements on education funding. Heidt has issued one press release a “Keeping the Promise” plan (and here, scroll down) for school finance reform ((I helped draft the plan) and a short video. There are no more important investments than those we make in our children. They are the future and each generation has an obligation to provide the next with the skills and knowledge they need to be successful. With a fair revenue system, there is no reason we cannot return to the Wisconsin tradition of supporting quality public education. He also notes past cuts to education under the Democrats and the inadequacy of their recent counter-proposal to the Republican decimation of our schools. No other candidate has been explicit on this. More importantly, no other candidate has offered anything like the detailed “Keeping the Promise” plan, nor the pledges to action contained in that plan. A combination of state funds and a reduced level of local property taxes derived and distributed in a manner that treats all taxpayers equitably regardless of local property wealth and income. Heidt vows to “work tirelessly” to see that this reform is achieved prior to the next biennial budget cycle. The sad history of AJR 35 (see here for AMPS posts covering that history)demonstrates the need for someone like Heidt in the Assembly. When the resolution was introduced, the Democrats controlled the Senate and the Governorship, but not the Assembly. Over 60 legislators signed on and the promise of comprehensive school funding reform was part of the 2008 campaign to “Take Back the Assembly.” The Democrats did take back the Assembly and once they did AJR 35 and school funding reform disappeared. Gone. Silence. When some of us who wanted them to keep their promises spoke up, we were told to be quiet because speaking or acting on this difficult issue might jeopardize their electoral prospects in November 2010. 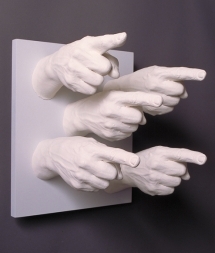 I for one didn’t keep quiet, but I’m not taking the blame for the electoral failures of 2010. Instead I’ll offer an alternative analysis — it isn’t the people like me who called for action who are to blame, it is the legislators who didn’t act and didn’t want to be reminded of their failure to act (I said much the same well before the November 2010 elections). Many of those silent, silencing and inactive legislators are now supporting other candidates who share their priorities and outlook in the race for the 48th. I’m supporting Andy Heidt. Susan Troller has a story — “Madison schools — the biggest loser” — on state and local school finance in today’s Capital Times. I’m off to the “Books not Bombs” action being held in conjunction with President Obama’s visit this morning, so no time for extensive commentary. Just some lengthy excerpts and a quick observation that although I miss the days when there were two daily newspapers and two reporters on the schools beat, I am glad to see the Cap Times doing some longer and bigger picture stories. Read the whole thing. When property tax bills go out in December, taxpayers will be hit with a $92 increase in property taxes on a $250,000 home, far higher than the modest $2.50 increase the board had predicted in May. Next year looks even worse, with a budget gap now predicted to be somewhere between $23 million and $25 million for the Madison school district, said Erik Kass, the assistant superintendent for business services. With the prospect of steep cuts in education as well as the potential for a new round of tax increases, the road ahead looks rocky. What happened? How did a formula designed to “equalize” resources among disparate school districts in Wisconsin create some of the unkindest cuts for Madison, the state’s second-largest urban school district, with nearly half of its students qualifying for free or reduced lunch? And where was the help from powerful Democrats in state government who had championed school funding reform when they were the minority party in the Legislature? The swift turnabout in Madison has left Madison School Board members bitter and exasperated. They’re deeply frustrated with the arcane shared-revenue formula that hits Madison especially hard and with 15 years of revenue caps that have forced school districts to pass budgets that couldn’t keep up with the rising costs. Madison, with 24,496 students, 47 percent of whom qualify for free or reduced lunch, will this year get just over $51.5 million in general state aid. The district got hit especially hard this time around because, unlike much of the rest of the state, its property values remained relatively stable despite the slump in the housing market. It did have some company in this regard. The Middleton-Cross Plains School District in Dane County, property-rich districts around northern Wisconsin lakes, and suburban areas in the greater Milwaukee area were also socked with the maximum 15 percent reduction in state aid because of their high property values. But unlike many suburban districts with high property values, Madison has other challenges, including a significant population of low-income students, English language learners and children with disabilities. The cost to educate these children is high, partly because of state and federal mandates that describe in detail what’s required to provide an adequate education. Unfortunately for Madison, the state general aid formula doesn’t account for these high-needs students when calculating who gets what. Meanwhile, the percentage of funding available from government through “categorical” aids targeted at these students has been steadily dropping for more than a decade. Madison School Board members are feeling particularly stung by this year’s budget cuts because, the economy notwithstanding, they thought this year might be different. After years of Republican control of the Statehouse, not only were Democrats in control of the Legislature and governor’s office, but Madison-area lawmakers were in charge of the budget process. As co-chairs of the Joint Finance Committee, the Legislature’s powerful budget-writing panel, Sen. Mark Miller and Rep. Mark Pocan were arguably in the most powerful positions to influence the process. But board members say they got little help from Democratic leaders, both on the specific problems surrounding the 2009-2010 budget and on broader questions about fixing the state’s long-term school funding. She says all local municipal officials bear a particularly heavy burden, forced to cut budgets and services and go back on their promises to hold the line on property taxes. Although Pocan is sympathetic to the frustrations of Madison School Board members, he says he and other legislators must balance the needs of the entire state. He agrees with Silveira and others that the funding system needs a “complete overhaul” but says that kind of change would likely come with a huge price tag, which some school funding experts suggest could reach a billion dollars. But when it comes to changing the law, little of substance has happened, reflecting the political difficulties of bridging deep divisions between what various school districts and communities want, as well as between various school stakeholders, from the teachers union to school board members to taxpayer groups. Pope-Roberts has been involved with education issues, including funding reform, since she was elected to the Assembly in 2002. She says Wisconsin’s current dismal economy constrains even those who are most committed to education and most dedicated to exploring a range of ideas. But Pocan and Pope-Roberts say they see glimmers of hope in some new, broad-based coalitions that are coming together to work on school funding reform. For example, the School Finance Network includes representatives from the Wisconsin Association of School District Administrators, the Wisconsin Education Association Council, the Wisconsin Parent Teacher Association and the Wisconsin Alliance for Excellent Schools, among others. Despite political differences that often put them at fierce odds in the past, as a group they agree that the current funding system is divisive, unsustainable and the reason many school districts lurch from budget to budget, with expenses rising faster than allowable tax increases. In its literature, the network notes that education has a profound long-term impact on Wisconsin’s economy and, that, if current conditions continue, it won’t be long before a number of school districts will be insolvent. Mertz, who teaches at Edgewood College and is a Madison district parent and longtime observer of public school issues, says his group of parents and concerned citizens is advocating for a sales tax increase – a program it describes as Pennies for Kids. While the proposal is not in a final form, he says he is hopeful the state Legislature will consider a 1 percent hike in the state sales tax. “A penny boost in the sales tax would bring us in line with surrounding states and would provide $830 million a year in aid for education,” Mertz says. The extra pennies would surely be welcomed in the coming years. With approval of the 2009-2010 budget under its belt, the Madison School Board is already beginning to focus on ways to address the larger shortfalls predicted for the following year. And so are other districts around the state. The Milwaukee Journal Sentinel recently reported that some suburban districts in the Milwaukee area are already hearing from residents unhappy about double-digit increases in local tax levies, and are considering potential program changes like combining athletic teams. 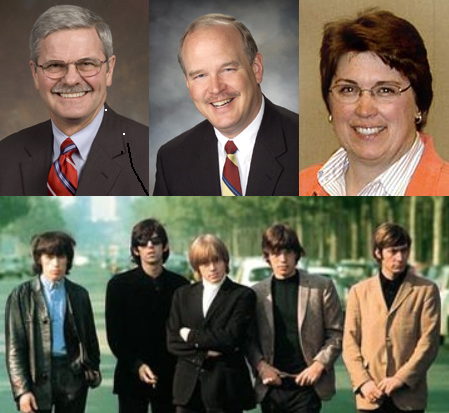 Statements by three Wisconsin State Senators on education in the 2009-2011 biennial state budget brought to mind three songs by the Rolling Stones, so I’m offering some special dedications. Read, listen, think, act (click on their names to contact the Senators). Before getting to the excerpts from the statements and the songs I want to say that whatever my opinion of the statements themselves, I want to applaud the Senators for talking about this in public. It takes a little courage to address these difficult issues and if nobody is talking no progress can be made. In the Wisconsin State Journal. The Rolling Stones , “It’s Not Easy” (click to listen or download). We all know it is complex and that change isn’t easy. As noted in regard to Miller’s fuller statement, change requires work and that work is the responsibility of the State Senate and Assembly. State budget hits local schools and property taxpayers. The Rolling Stones, “I Am Waiting” (click to listen or download). Senator Schultz has been in his position since 1991; before that he served a decade in the Assembly. By the standards generally applied to Republicans in Wisconsin, he has been considered a “friend of public education.” This is mostly because he often says something close to the right things. Words are nice: actions are needed. Leadership would be even better. I am waiting. “We don’t have the money to do school funding reform,” goes conventional wisdom around the Capitol. It costs money to fix the funding formula and money is in very short supply. Given the state’s fiscal condition, many considered any reform of school funding impossible. But in our Senate District schools simply can’t wait…. Fixing School Funding One Step at a Time. The Rolling Stones, “You Can Make It if You Try” (click to listen or download). This last song goes out to all the Senators and Members of the Assembly, but Senator Vinehout seems to display more of the “can do,” “get-er’-done” spirit than most who work at the Capitol (including elected officials, staff and lobbyists). As the Miller quote indicates, many will always find reasons why progress and reform can’t happen. I believe it can and must happen. The first step is trying. The School Finance Network (SFN) and the Madison Board of Education released reactions to the education provisions of the recent state budget today. Both are worth reading. Not-so-well-known Fact #1: The ongoing difficulty of school boards and administrators in making ends meet is not the result of a lack of oversight or innovativeness. Quite the contrary is true. Most schools are in trouble due to 16 years of revenue controls that have curtailed their ability to adequately deal with basic costs, such as fuel, textbooks, technology and utilities. After 16 years of state-imposed budgetary controls and stagnant or declining state support, boards and administrators have had to make significant budget cuts. School boards are now in the position of having to eliminate critical educational programs, lay off more staff, and further defer necessary school maintenance projects in order to balance their books. These cuts will have long term negative consequences for our schools and our students, and for the state as a whole. 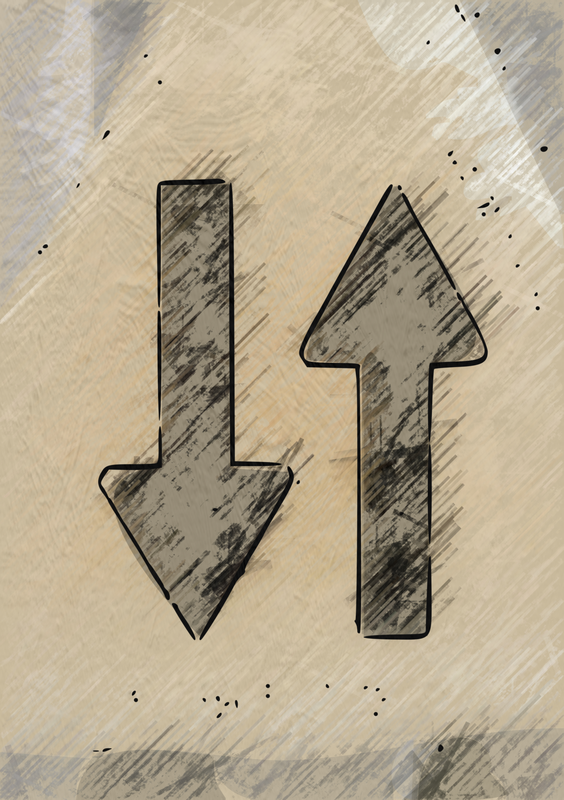 #2 delineates the combined effects of the 3.1% cut in state aid and the reduction in revenue cap growth. Not-so-well known Fact #3: While most Wisconsinites take great pride in our state’s schools, in the last 15 years Wisconsin’s national rank for per-pupil expenditures has declined from 11th to 19th. This is partly because $800 million dollars that is distributed as state tax credits is categorized as spending for education, but it isn’t actually spent on education. So, while many think the state is picking up two-thirds of the costs of our schools, the level of state support has steadily declined, and today our schools actually receive only a little more than one-half of their support from the state. As a result,greater responsibility for funding our schools is being shouldered by local property taxpayers. No-so-well-known Fact #4: If $900 million in property tax relief credits included as spending for public education were actually allotted to Wisconsin’s 864,000 school children, per-pupil expenditures would be $1,040 more than they are today, and the state would be ranked 12th nationally in per-pupil expenditures, rather than 19th. Not-so-well-known Fact #5: To make matters worse, the most recently passed state budget added monies to a “poverty aid program” for schools, but schools do not get an additional dime from this, since the program is actually a tax relief program for residents in districts with low-income students. More on the levy credits from the Legislative Fiscal Bureau here. We are hard-pressed to find the silver-lining of the dark cloud of a budget that presents itself. A cut in the allowable revenue limit increase from $275 per pupil to $200 is a loss of nearly $2 million in resources for Madison classrooms. Additionally, the district will lose nearly $1 million in categorical aid. More problematic is the $9.23 million loss in general school aids – a cut of over 15% when compared to 2008-09. A loss of this magnitude only re-emphasizes our call for comprehensive reform of school funding in Wisconsin. The district has cut over $60 million in programs and services for students since the inception of state-imposed revenue limits. While we continue to examine all aspects of our local budget for efficiencies and improvements, the loss of nearly $12 million in resources from the state can not be made up by improving bus routes. Our options are to eviscerate programs, eliminate more opportunities for students and untenably large classes, or use the local property tax levy to fill the gaping hole left by the state. Regardless of what we choose to do, in the final analysis, more cuts must be made. Digging further into the details of the Madison situation reveals that the biggest problem under the current system is that Madison is a high spending, high property wealth district at a time when state investments in education are falling further behind costs. Because of this combination, the current system and funding levels hit Madison hard. I believe in the concept of equalization, but the concept must start with a commitment by the state to provide a foundation of adequate resources for all districts and schools (not necessarily a “foundation plan,” but the equivalent in support; Wisconsin’s system has been called a “backwards foundation plan“). Both the timing and the size of the adjustments Madison must make are difficult, to say the least. 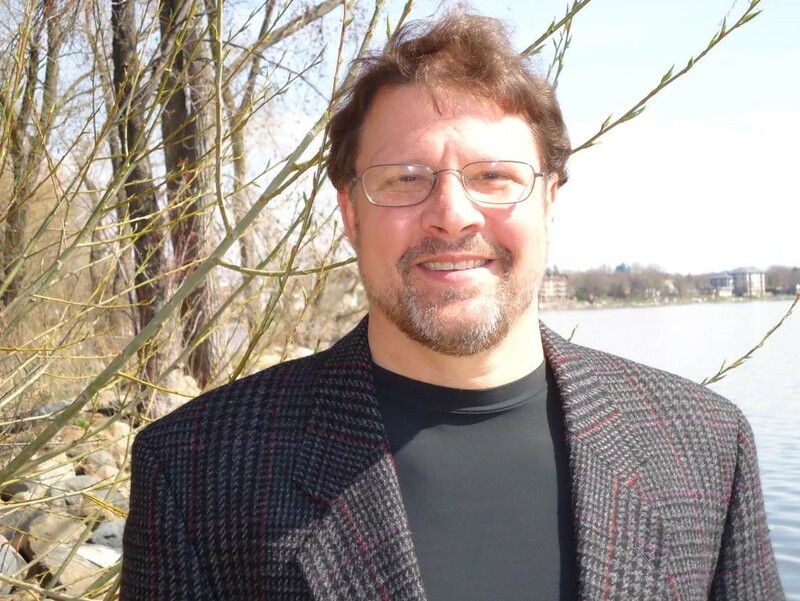 SFN and the Madison Board close with calls for a comprehensive fix. Throughout the state, there is a growing sense that something needs to be done to fix Wisconsin’s broken school funding system. We could start by getting the facts straight on school spending, including how much of that spending is supported by the state. In these difficult economic times, it is more important than ever that our students receive a quality education, one that prepares them for their future jobs, and the opportunities and challenges that lie ahead. The failure to provide our children with a quality education threatens not only their future, but the future well-being and prosperity of our entire state. Senator Mark Miller (D-Monona) issued a statement giving his spin on education funding in the recently passed Wisconsin budget. It is a confusing statement, in that Miller seems to all but ignore the continued shift in funding from the state to local property taxpayers (the old 2/3 formula is long gone, we are now struggling to stay above 60% and if the levy credit is treated as what it is — property tax relief — the real level of state support is hovering a little above 50%) to concentrate on the last minute, behind closed doors insertion that was intended to limit the cuts in state aid to any school districts to 10% or less (Quadric Aid anyone?). Things didn’t work out as planned, resulting in some 100 districts (including MMSD) taking hits of 15% (see this editorial from the Appleton Post Crescent for more). As far as I can tell the $4,519 in lost aid to MMSD that Senator Miller refers to is the portion of the loss due to the 10%/Quadric Aid legislation. In total MMSD is experiencing a $9 million shift in funding that must be filled by local resources. I hope to have a chance to write more about Senator Miller’s figures and other budget numbers soon. The current funding system is inadequate in all these areas and the recent budget moved us in the wrong direction on all of these. All of us can point the finger at the “school aid formula,” but only Senator Miller and his colleagues in the Senate and the Assembly have the power to change it. The video is of Randy Kunsch of the Phillips School District testifying at the 2007 hearing on the Pope-Roberts/Breske Resolution. He was one of the organizers and participants in the first Walk on the Child’s Side in 1999 and will be speaking at the June 16th 10th Anniversary Rally. Art Rainwater, former superintendent of the Madison Metropolitan School District, and participant in the first Walk.